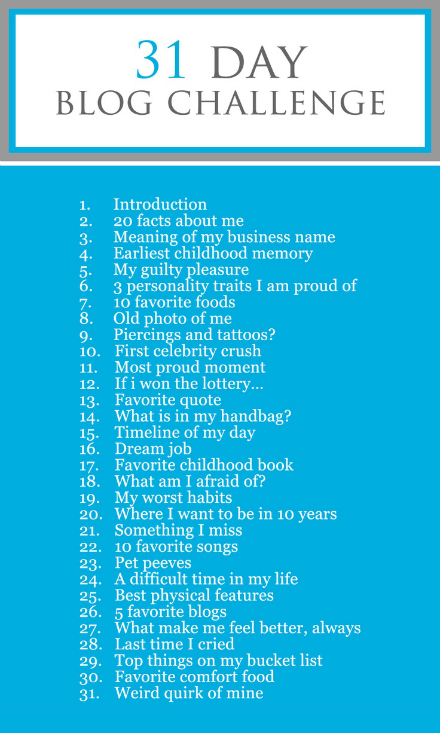 I've really been really wanting to do a blogging challenge & have been searching high & low for one that I liked. I finally came across one on Pinterest that I decided was the one for me. I picked this one because I genuinely liked all of the topics that were listed for each day. Unfortunately the blog that this challenge came from is no longer up, but I have linked the Pinterest pin above. I want to put a disclaimer that this is not going to be a consecutive challenge, this is more of a post 'bucket list' for the next few months. I know I would not be able to forgo posting about the Oscar fashions, or beauty products, or something else that really sparks my fancy so on those days I will take a day off from the challenge. I am going to try to blog on both weekend days, but I know that that might not work out so I will just pick up where I left off the next day. I am doing this in a very relaxed way, as something fun to spark my creativity, & to challenge me to write about certain topics. I hope you all enjoy it as much as I plan to! 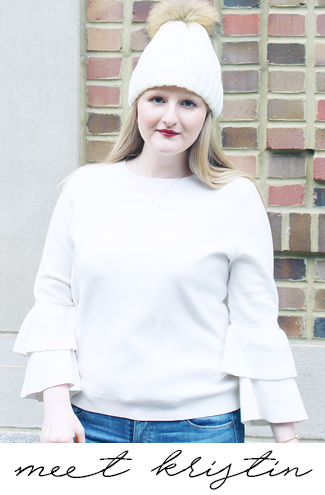 I've been here for a little over 8 months & while you can hop over to my About Me page (which I am in the process of redoing a bit), I love the idea of reintroducing myself a bit. Without further ado here we go! This is just a little reintroduction of myself! I cannot wait to share more over the next month or so with this challenge & would love for all of you to join me. 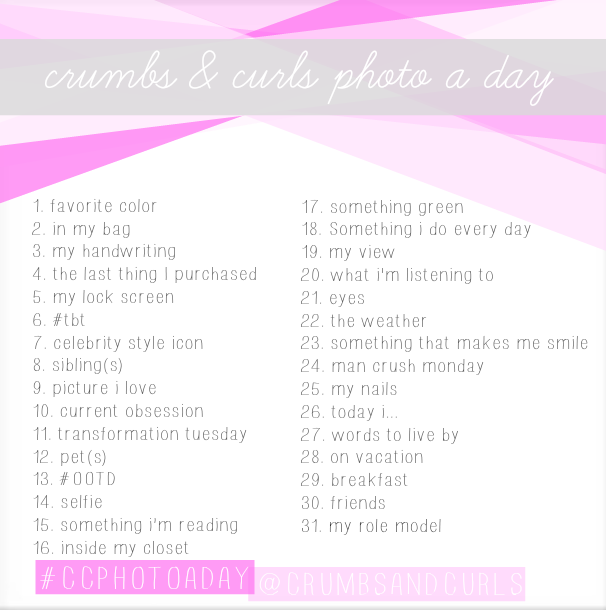 Today I am also announcing the launch of the Crumbs & Curls Photo a Day Challenge! This is a challenge for everyone to post a month's worth of pictures on their Twitter or Instagram accounts. I've always loved these & am beyond excited to have created one of my own. Basically you just have to take a picture for each day (on your first day do #1, on your twentieth day do #20), post it to Instagram, Twitter, or both, & include #CCPHOTOADAY so we can all see each other's pictures! This is all set up to fit on Instagram! If you just save it as the original size you will be good to go! I did not date this so that everyone can start whenever they want & it is not specific t to a month. I hope that everyone can enjoy this as much as I will & I cannot wait to see everyone's posts! 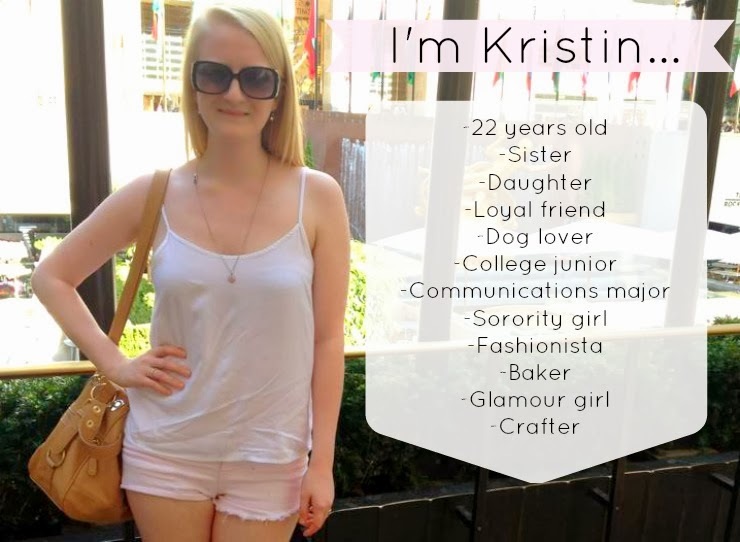 Kristin- this is such a great idea! I'm going to try very, very hard to participate in the photo a day challenge! Such a cute challenge! Looking forward to reading all the tidbits about you!